Optical frame sizes are represented by three numeric designations: eye size - bridge - temple length (for example: 65-15-120). All measurements are in millimeters. The horizontal width of each eyerim. The bridge, or distance between the eyerims. The distance from the hinge screw to the end of the temple tip. The total horizontal width of the sunglass frame front. 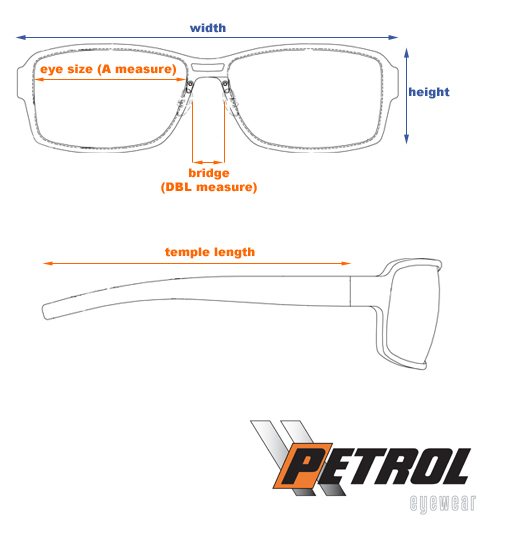 The vertical depth of the sunglass frame front.